In the earlier five seasons of House of Cards, Frank Underwood (played by Kevin Spacey) represented the Machiavellian Chief Whip then Vice President, and then President. As he manipulated his fellow party colleagues, foreign prime ministers (principally Russia), we witnessed the dark truths of American politics by a despotic megalomaniac. Now, in Season 6, Frank Underwood is dead, but we don’t know how. His widow, Claire Underwood (the phenomenal Robin Wright) is President and has inherited her dead husband’s enemies. Dealing with the aftermath of her husband’s death, and declaring that “the reign of the middle-aged white man is over”, Claire clashes with corporate moguls, the Russian prime minister, and her own vice president. Trying to forge her own path as President, Claire takes no prisoners and feels no regret. But Claire’s late husband still casts a long shadow. “Frank’s legacy” is the cornerstone of the series finale. 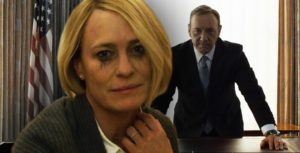 The powerful ending of this season of House of Cards is dramatically sharpened and has an even darker theme: gender issues and patriarchy infused with a stench of misogyny. 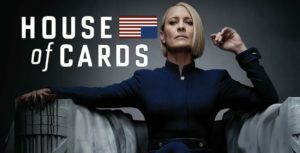 Claire’s dark secrets venomously boil over, ratcheting towards an ignominious confrontation with Doug Stamper, Frank Underwood’s obsessively devoted acolyte who cannot forgive Claire for what he imagines she is doing to Frank’s legacy. Overlaid with the backlash of the first female President, we see Claire have to disassociate from her husband’s despicable acts. Nevertheless, her political enemies delight in accusing her of being guilty of Frank’s sins. Frank’s reach is beyond the grave. As Claire’s enemies come close to impeaching her, Claire does what she and Frank did the last time they got close to defeat: she manufactures a crisis. Claiming that terrorists are attempting to acquire a nuclear bomb, she creates a military standoff between U.S. and Russian troops in Syria. It’s the thunderous theme of House of Cards: Power is fragile– and we watch as the powerful can be brought tumbling down by the smallest misstep. Claire’s own reign is ultimately doomed to fail, playing a near-impossible game, but as we watch we don’t know how or when. House of Cards in its final season ends on a dramatically different, more ambiguous and amoral note, than any of its previous seasons or its BBC predecessor. What Frank and Claire did may not really be out of the ordinary. House of Cards is more about the undetected, malignant form of insatiable power: more difficult to expose and defeat. Totally unexpected, this season of House of Cards is a different and more frightening look at unhinged power. Robin Wright is a marvel to behold! Note: I have reviewed Seasons 1-4 previously.